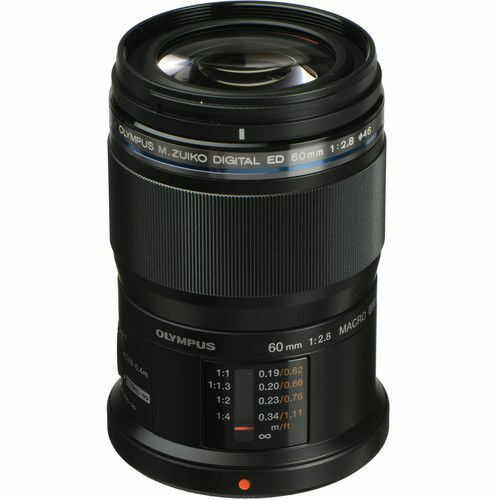 A versatile lens optimized for working with close-up subjects, the M.Zuiko Digital ED 60mm f/2.8 Macrofrom Olympus is a 120mm equivalent prime for Micro Four Thirds mirrorless cameras. Pairing with the telephoto focal length, the lens offers a maximum 1:1 magnification and a 7.5" minimum focusing distance to permit photographing close subjects with fine detail. A Focus Limit Switch can also be used to better facilitate working at close or distant range by constraining the focusing mechanism for faster, more precise AF. Also contributing to focusing performance, a Movie & Still Compatible system is used to offer quick, quiet, and smooth AF that is suitable for both photo and movie applications. In regard to the optical design, extra-low dispersion and high refractive index glasses are used to control a variety of aberrations and a ZERO coating has applied to suppress flare and ghosting to improve contrast and color accuracy. Telephoto prime lens is designed for Micro Four Thirds mirrorless digital cameras and provides a 120mm equivalent focal length. Ideal for macro shooting, this lens offers a life-size 1:1 maximum magnification along with a minimum focusing distance of 7.5" to suit working with close-up subjects. The lens barrel also has an indicator window with scales for working at 1:1.3, 1:2, and 1:4 magnifications, and a Focus Limit Switch can be used to constrain the usable focusing range for faster, more controlled performance. One extra-low dispersion element suppresses chromatic aberrations and color fringing to realize a high degree of clarity and color accuracy. One E-HR (Extra-High Refractive index) element and two high refractive index elements are also featured in the optical design to control spherical aberrations and distortion for accurate rendering and high sharpness. Internal focusing mechanism maintains the overall lens length while focusing for easier use when photographing close-up subjects. Splashproof and dustproof construction benefits working with this lens in inclement conditions. Rounded seven-blade diaphragm contributes to a smooth bokeh quality.